Muddling is a technique of mashing up fruits and herbs classically used in cocktail making. Here, cherries are muddled for use in cocktails, sure, but also as a sauce or condiment. Mashing up pitted cherries with a bit of sugar creates a bit of a sauce and a bit of a purée that is pure magic. It's a brilliant red color that will dye anything it touches (for better or for worse! ), and it has endless cherry-licious uses. Stir it into drinks (such as this Cherry Gin and Tonic), pour it over ice cream, mix it into yogurt, add it to smoothies, use it as a glaze on ham (seriously! ), or come up with your own favorite way to use it! Note that frozen cherries work just dandy when making muddled cherries. The slight way that freezing affects their texture is in no way a detriment here since the whole point of muddling is to break down the cherries into a bit of a slurry anyway! Let them defrost before muddling them for the best effect. Feel free to adjust the amounts to suit your needs—just a few . Start by pitting the cherries. You can use a cherry pitter, but a manicure stick, thin chopstick, or tweezers work just as well—just dig into the center of the cherry and pop out the pit. Be sure to pit them over a bowl to catch their juices and then add the cherries to the bowl once they're pitted. If you're not as familiar with pitting cherries as you might be, check out How to Pit Cherries. (Love the taste of cherries? Save the pits and make Cherry Pit Vinegar.) If using frozen cherries, let them defrost before muddling them. Sprinkle the pitted cherries with 1/2 cup of sugar. Use a fork or pestle to mash the cherries and sugar together a bit. Cover and let sit for about an hour. Mash the mixture a bit more to smooth it out a bit. Taste it and add more sugar to taste, if you like. I prefer to keep the sugar fairly light so the bright flavor of the cherries can shine through, but plenty of people like things way more sweet that I do! 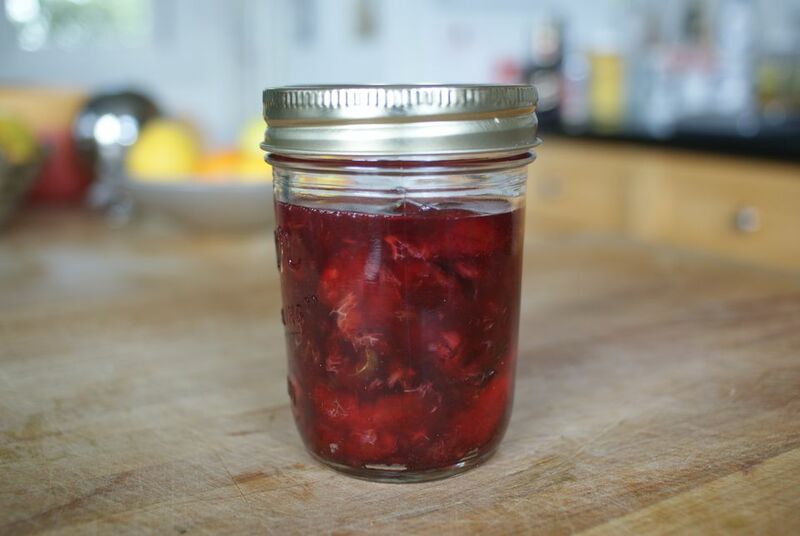 Use the resulting muddled cherries as you like or keep them, covered and chilled, up to three days.